One aspect of the summit I always find valuable are the examples that are shared by the attendees. It is great to hear how you can leverage technology, but it is amazing to actually see and hear from someone who is doing it, from a peer. At the summit, you learn what worked for them, how they accomplished what they have, what are their next plans. There is nothing like it. 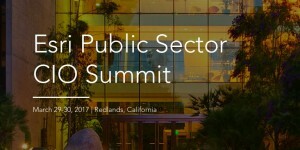 Last year Carla Simmons, the CIO for the California Governor’s Office of Emergency Services, presented the work her agency had accomplished in the year leading up to the Summit. Carla shared that CAL OES progressed from having just a few desktop users, to empowering the agency with a location platform through configurable solutions. They integrated the solutions into their business systems and gave everyone from leadership, to field staff, to power users, to citizens, the applications and tools they need to respond and react to events in the State of California. There was another interesting panel discussion on Strategies for Amplifying Innovation, moderated by Steve Ressler from GovLoop with panelists: Steve Young, CIO for State of Washington DNR, Steve Reneker, County of Riverside CIO and John Keisler, Innovation Director, City of Long Beach, CA. This panel highlighted the importance and challenged and inspired attendees to be constantly innovating. There are too many great presentations by attendees to share, but I am looking forward to hearing more in March. And what is a great summit without the people? Over the last few years I have watched CIOs from the same state get to know each other and discuss how they can collaborate more effectively, and how they can share authoritative data between their agencies. I have seen and heard the excitement from a State CIO when they align their vision and challenges for an agency with the ArcGIS platform and how it helps them quickly achieve some or all of that vision. And finally, I always enjoy the breaks, the lunches, the dinners and the social opportunities where we all talk and learn from each other. 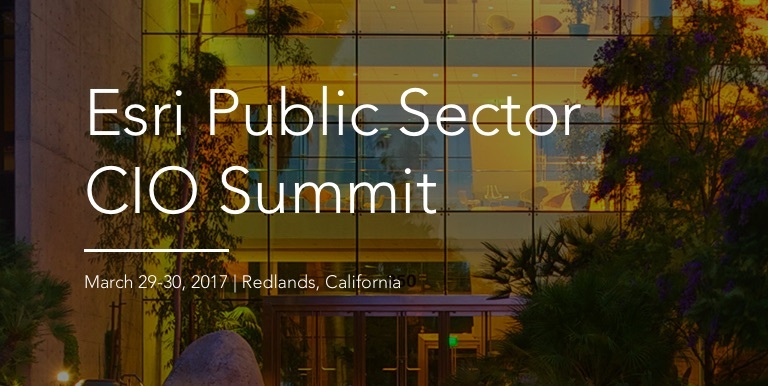 As a public sector CIO, I hope the Esri Public Sector CIO Summit becomes one of your favorite events to attend each year. To register, please visit http://arcg.is/2hhO6Tb.